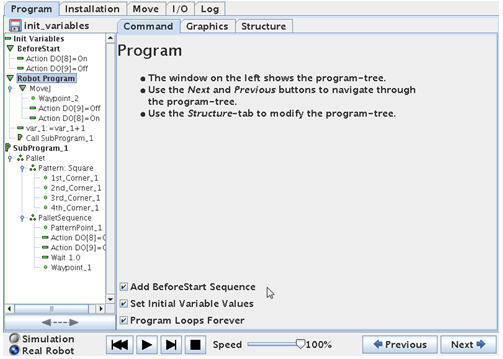 The section of “BeforeStart” in the program tree is programmed with the normal programming method, but will be executed only one time before the main program starts. In some cases it is desirable to have a program sequence which is run before the main program is started and also to set variables to an initial value and to determine if the program should only have one passages or loop forever. All these features can be achieved from the “Robot program” screen. Point the cursor on “Robot Program” in the program tree structure and a screen like below will appear. Below in the centre screen is three tick boxes where “Add Before Start Sequence” and “Set Initial Variables Values can be activated. And the choice whether the program should have only one run or loop forever is also set in this screen. When “Add BeforeStart Sequence” and “Set Initial Variable Values” are ticked they will be added to the program tree at the top.